Nick Bosa is gone. Jashon Cornell is moving to defensive tackle. Junior Chase Young and senior Jonathon Cooper return as clear starters at defensive end. But the Buckeyes need depth to keep those two fresh. If Saturday’s Spring Game is any indication, sophomore Tyreke Smith is emerging as option No. 3. Smith led all defenders with 1.5 sacks, finishing with 3.5 total tackles in the game. Overall, the Ohio native appeared more confident, growing into his new role as a leader in the room. Coming in as a four-star prospect, Smith went through the typical first-year learning curve with just nine tackles and zero sacks in 2018. Moving forward, he knows there’s plenty of strides to make before he finds a larger role next season. Head coach Ryan Day recognizes the importance of a strong third defensive end, particularly in the defense Ohio State will run. 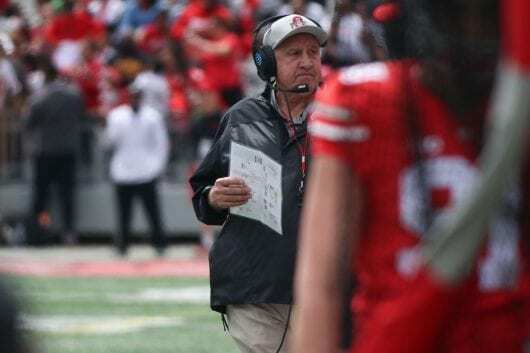 The Buckeyes have a history of rotating defensive linemen, a philosophy co-defensive coordinator Greg Mattison has said he intends to stick with this season. Defensive line coach Larry Johnson is also playing a critical role in Smith’s development. Johnson holds a track record of developing defensive fronts, producing six NFL draft picks since arriving at Ohio State in 2014. He’s motivating Smith to continue improving. As a whole, Ohio State’s defensive line is working on the mental aspects of football as much as they are the physical this spring. Diagnosing a play and knowing opponent tendencies helps a player gain that extra edge: When you know what’s coming, it’s easier to defend. Young sees Smith as a cog in Ohio State’s defensive line machine this season, one that he hopes will be well-oiled come fall.